Join CODEPINK and more in Washington DC on May 7th in saying no to violence and war! RSVP Below! 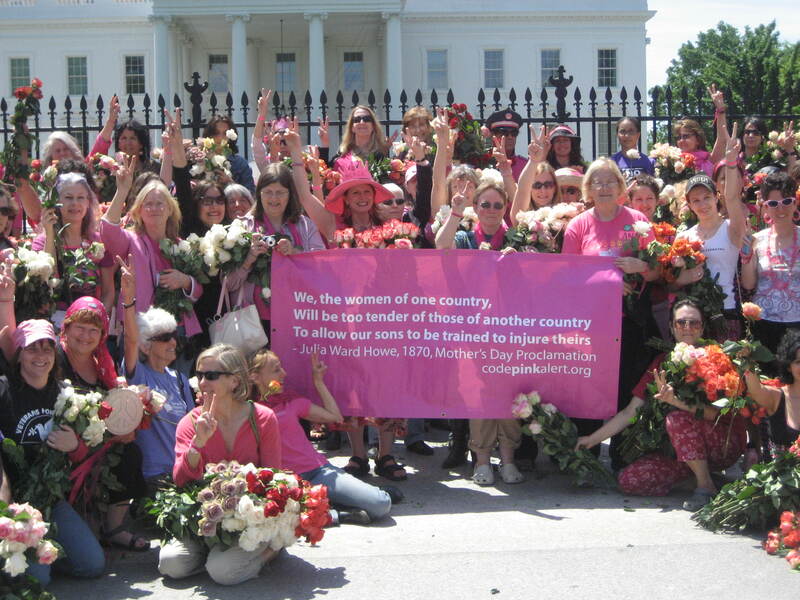 Join CODEPINK this year on Saturday, May 7th from 2pm to 8pm for a Peace Vigil and celebration in front of the White House to celebrate the original Mother’s Day call: a time for women to come together to organize against violence and war. It's a day to say DISARM, DISARM! In 1872, Julia Ward Howe called upon mothers to support an end to war when she declared the first "Mother's Day for Peace” in the US. This year, we return to our roots and bring together our mothers, daughters, aunts, children and all who want to work for peace. The Mother’s Day Peace Festival will feature storytelling, performances, art, music and dancing. Everyone is invited to contribute. Here is Julia Ward Howe's Mother's Day Proclamation. We will come together to reject violence across the world. We say NO! to militarization of the police, mass incarceration and killing of black youth across the U.S., Islamophobia, attacks on immigrants, violence against transwomen. We honor the Movement for Black Lives that reaffirms the dignity of all people. We STAND UP! against the selling of arms to repressive Middle Eastern governments, American killer drones that terrorize families, forms of feminism that justify war, and a culture of militarization that echoes around the world. We celebrate grassroots movements for democracy and human rights for people everywhere. We defend women who have been subjected to cruelty and violence. Join us in Washington, DC to reject violence around the world and build local peace economies. Love the Mother’s Day Proclamation. I have this history in my book The Peacemaker and post a video I did of it on youtube every Mother’s Day. This is exactly what our heritage is and we women have to start acknowledging that before anything else.